In a nutshell, successful recovery from a business interruption involves safely keeping a backup of critical data and systems and making them available as quickly as possible. 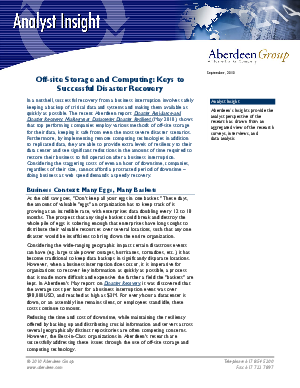 The recent Aberdeen report "Disaster Avoidance and Disaster Recovery: Making your Datacenter Disaster Resilient" (May 2010), shows that top performing companies employ various methods of offsite storage for their data, keeping it safe from even the most severe disaster scenarios. Furthermore, by implementing remote computing technologies, they are able to provide extra levels of resiliency to their data center and see significant reductions in the amount of time required to restore their business to full operation after a business interruption.